Suffering from painful cavities? 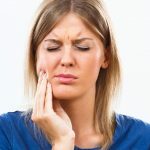 Tooth-related problems are always painful to deal with, but cavities are definitely the worst. They can make eating or drinking anything hell for you. Read on to know more about this problem and how you can treat it with simple home remedies. Cavities are small holes that occur in the teeth as a result of tooth decay. This happens due to the lack of dental hygiene and accumulation of bacteria and plaque. It can also be due to the lack of minerals in the diet. Besides the cavities in the teeth becoming prominent, the onset of tooth decay is also characterized by the presence of a sticky black deposit in these cavities. Sometimes, despite all efforts, precautions, and care, one might get affected by tooth decay, which will ultimately lead to cavities. In that case, you can try these home remedies to keep tooth decay at bay and your oral health at its best. After brushing, gargle with a mouthwash that contains fluoride. Do this every morning and before going to bed. Fluoride is good for the teeth and helps to remineralize them. Since lack of minerals is a valid cause of tooth decay, using a fluoride mouthwash is an effective home remedy for tooth decay and cavities (1). Grind equal numbers of calcium and magnesium tablets to get a fine powder. Use this powder to brush your teeth. This remedy has two benefits. Firstly, the calcium and magnesium help to remineralize your teeth (2). Secondly, it keeps your mouth alkaline, preventing the acid from the cavity from affecting your teeth. Take a capsule of each with any meal during the day. 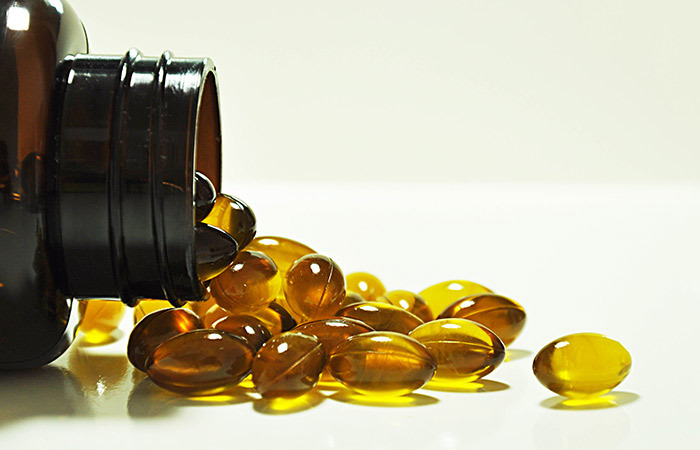 Take these supplements regularly to maintain optimum dental health. Cod liver oil and butter oil are said to be rich in vitamins A, D, and K, which are excellent for maintaining dental hygiene (3). You can either take these two supplements separately or take a capsule that contains both. Boil the animal bones in water until the broth becomes thick. Add salt and black pepper powder. Drink this soup while it is warm. You can also store this broth in the freezer for a few days and use it in other meal preparations. Include bone broth in your regular diet. Bone broth has numerous beneficial qualities as it is loaded with vitamins, minerals, and healthy fats. It helps in improving your digestive system and strengthens your nail, hair, and skin. The broth, a rich source of calcium and magnesium, helps to remove cavities and fight tooth decay (4). Add salt to warm water and mix well. Rinse and gargle your mouth with it. Make sure you rinse the cavities thoroughly. Gargle with salt water twice a day. 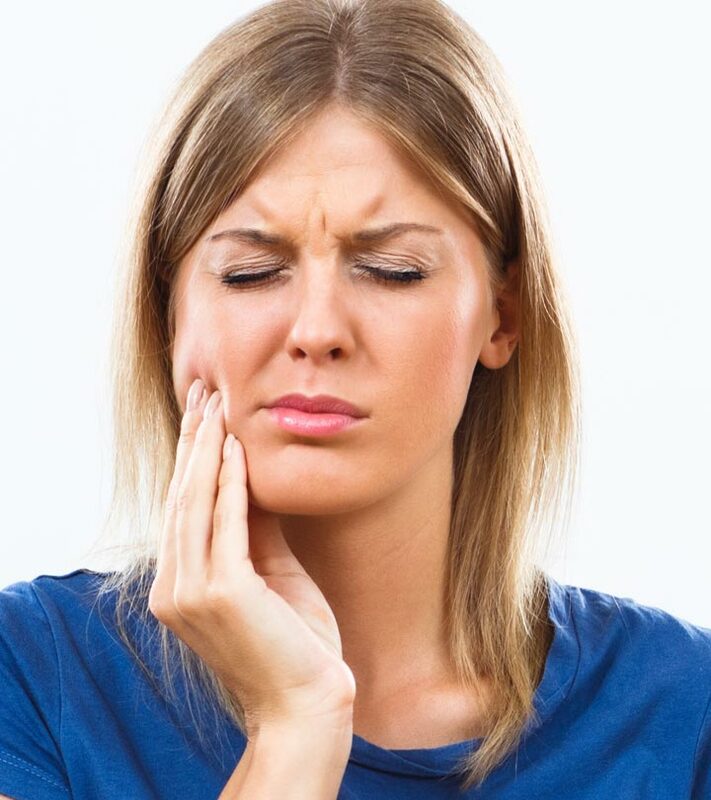 This is probably the most common home remedy for any tooth-related pain. It keeps the mouth bacteria-free and removes the stickiness from the cavities. The salt solution balances out the acidic pH created by the tooth cavity (5). Take a bit of clove oil on your forefinger and lightly massage the cavity affected affected with it. If the affected tooth is hard to reach, use a cotton swab dipped in clove oil for application. Apply clove oil 2-3 times in a day. Clove oil helps in relieving the pain caused due to cavities and tooth decay. Eugenol, a key essential oil found in clove, is responsible for this analgesic action. Its antimicrobial constituents inhibit the growth of various types of bacteria, fungi, and viruses (6). 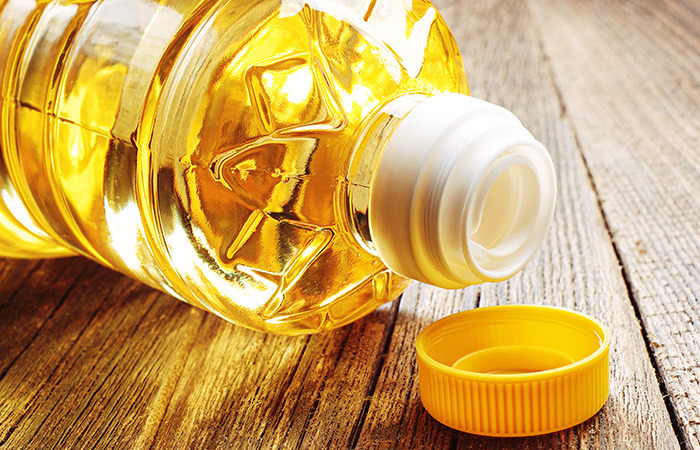 Take the small cup and fill it with vegetable oil. Rinse your mouth with the vegetable oil for 5-10 minutes. Then, spit it out. You can also use coconut oil or olive oil for this. Repeat this 1-2 times every day. This method is known as oil pulling. It is supposed to be effective in removing tooth infection and relieving pain. The swishing action pulls the bacteria and traps them in the oil. This technique also decreases any swelling that may be present in the gums (7). Make a mixture of equal quantities of gin, vodka, and whiskey. Take a clean washcloth and dip it in the solution. Then, use it as a compress against the cavity-affected teeth. Keep it on for 4-5 minutes. The alcoholic content of these beverages will relieve the pain and also kill the bacteria causing the tooth decay (8). During the first contact, the alcohol may sting, but this sensation subsides after a while. Dip the cotton swab in the vanilla essence and apply it to the affected tooth. Also, apply the essence on the surrounding gums. 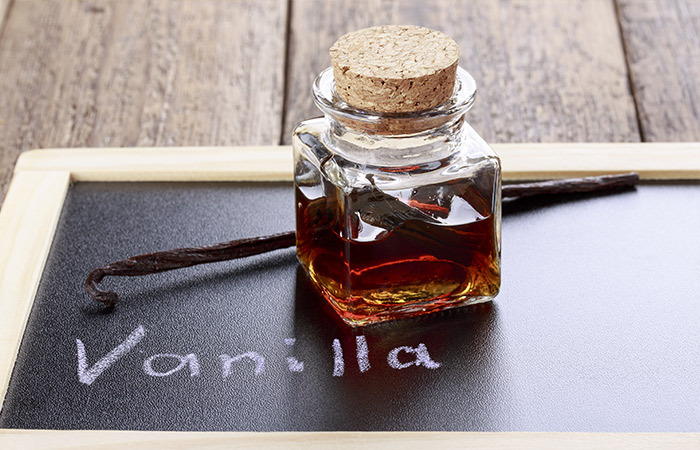 Vanilla essence, in its pure form, has been known to be an effective remedy that can be used to relieve the symptoms associated with cavities, mainly toothache. It is also antiseptic in nature (9). Massage the teeth and gums with this gently. Leave it on for 3-5 minutes and then gargle. Ensure you gargle properly to get rid of the salty aftertaste in your mouth. Use this every day to get rid of cavities naturally. Rock salt and mustard oil occupy an integral part in Indian kitchens. These ingredients are used in our day-to-day cooking and kitchen preparations. Mustard oil is antimicrobial in nature, while the salt helps to balance the pH levels in the mouth (10). 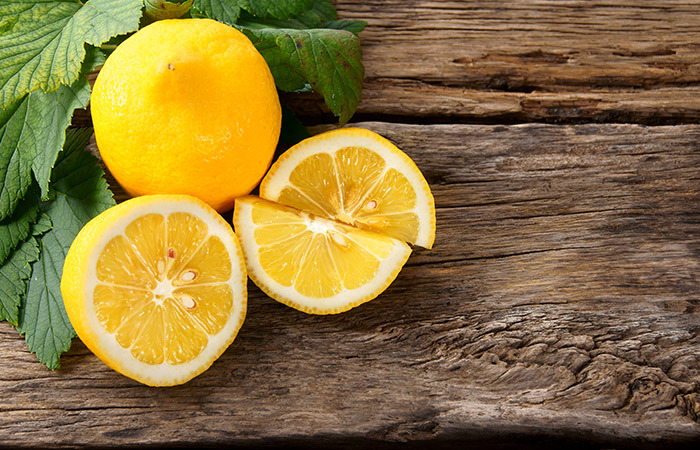 Chew on a slice of lemon for a few minutes. Rinse your mouth with clean water thoroughly after this. Repeat this as and when required to relieve the pain from tooth decay. Lemons are a rich source of vitamin C. The acids presents in lemon juice kill the germs to help ease the pain caused due to cavities (11). Drink a cup of wheatgrass juice in the mornings. Have this healthy juice every day. Wheatgrass keeps the growth of bacteria in check due to its antibacterial properties. Drinking wheatgrass juice will kill the bacteria in the mouth. It can also help alleviate the pain that accompanies tooth decay (12). 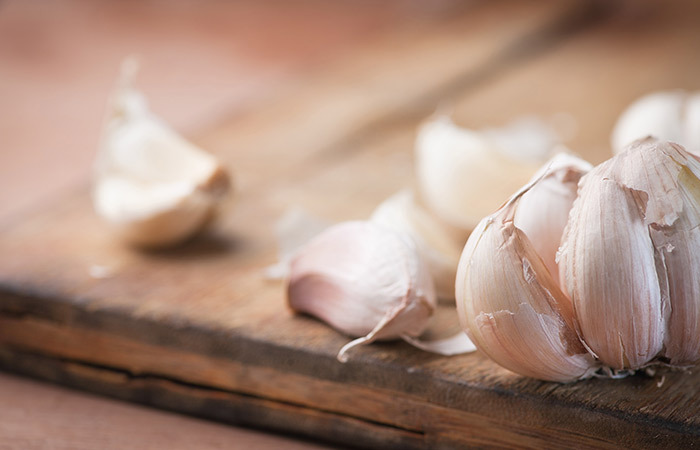 Chew the garlic clove, preferably in the mornings, on an empty stomach. Do this every day in the morning. We all love garlic in our daily food, but if we are asked to eat a raw garlic clove, we are sure to find that repulsive. Garlic is a wonderful spice and herb found in every kitchen. It has antifungal and antibacterial properties and, at the same time, helps relieve pain by working as a painkiller (13). Brew a cup of hot green tea. Add honey and lemon juice according to your preference. Drink while it is warm. You can also brew some fresh black tea if you do not have green tea at home or prefer black tea over green. Drink 2-3 cups of green tea every day. Considered as an effective way to kill germs, green tea keeps the teeth healthy, reduces the production of plaque, and keeps bacterial growth in check (14). Massage your teeth and gums with tea tree oil. 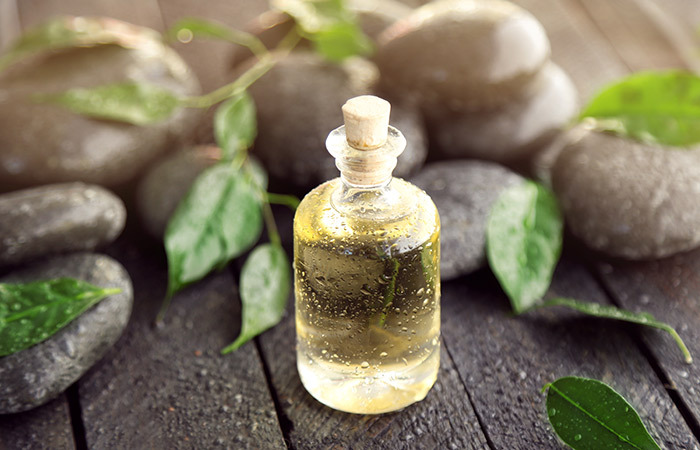 Tea tree oil can be used to keep the mouth healthy, gums strong, and the teeth decay-free. This is because tea tree oil has antibacterial and anti-inflammatory properties (15). Mix the essential oil, salt, and water. Dip your toothbrush in this mixture and brush your teeth with it. You need to brush your teeth at least once a day with this mixture to keep them healthy. Oregano oil can work as a good home remedy for cavities as it kills the bacteria that cause tooth decay and plaque (16). Some people might take time to get used to the taste and flavor of the oil. Chew on the neem twig for a few minutes. Rinse your mouth with water afterwards. Neem oil can also be applied to the affected tooth and the surrounding gum. Do this every day to keep your mouth fresh and teeth clean. 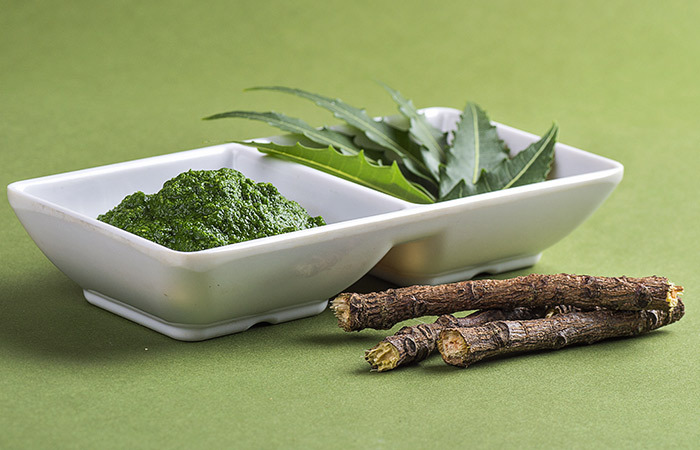 The good old neem twig (neem datun) may seem like an outdated way to keep your teeth clean, but it is definitely an effective way to get healthier teeth. While chewing the hard neem twig makes your teeth and gums stronger, the powerful plant oils and compounds that are released in the mouth are highly effective against the bacteria that cause tooth decay. They also have high fiber content that makes them highly effective in keeping plaque away (17). Mix the two extracts and apply the mixture on the affected tooth. Repeat 2-3 times in a day. As common as vanilla is, its extract is expensive. Practitioners of alternative medicine recommend using vanilla and almond extract to help heal tooth decay. Wet the toothbrush and dip it in baking soda powder. Brush your teeth with this. Do this every alternate day for a few days. 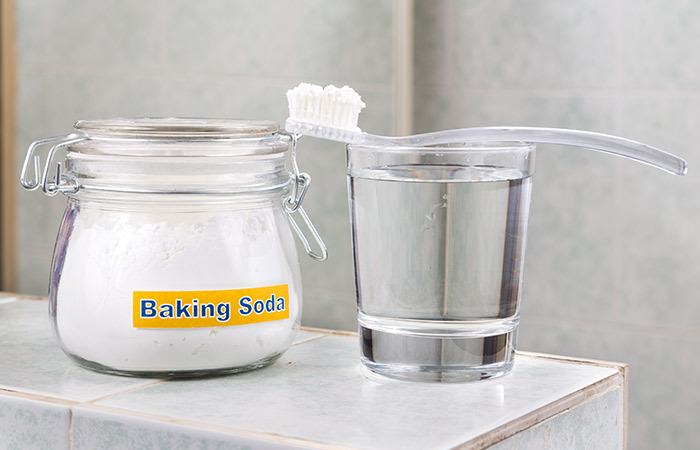 The alkalinity of baking soda neutralizes the excess acids in the mouth that cause tooth decay and cavities (18). Baking soda is also an antimicrobial agent (19). Daily use of baking soda over prolonged periods can damage the tooth enamel. Use this remedy only for a few days. Mix all the ingredients and use the mixture as toothpaste. Brush your teeth twice a day with this natural toothpaste. Bentonite clay is excellent at absorbing all the impurities from its surroundings, and this is exactly what it does when used as a toothpaste. It absorbs and removes the black/brown sticky deposit from the infected tooth along with the bacteria (20). Add the walnut tincture to the water and swish this around in your mouth for a minute or two. You can either spit this water out or swallow it. Do this 2-3 times in a week initially. Taper it down to 4-5 times a month after a week or two. 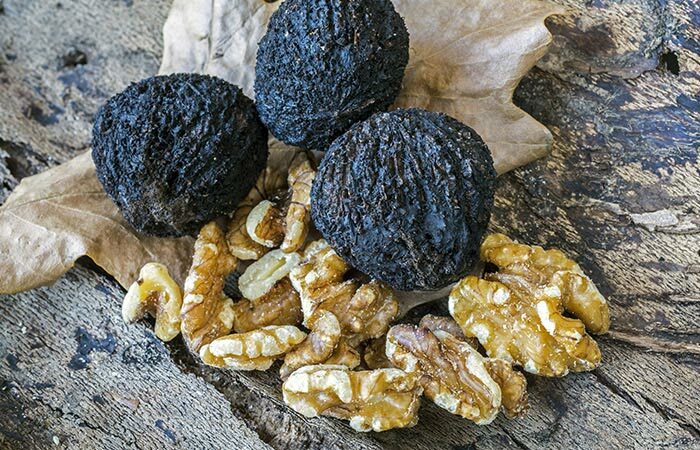 Black walnut tincture has the ability to kill the microorganisms present in the mouth efficiently. It is antibacterial, antifungal, and antiparasitic in nature (21). Clean the eggshells and boil them for a couple of minutes. Remove and air dry. Once the shells are dried, grind them to get a fine powder. To this, add the baking soda and coconut oil to get a smooth paste. You can add more coconut oil if required. Use this as a toothpaste. Store the rest in an airtight container. Use this toothpaste every day. Eggshells are composed of calcium carbonate, which acts as an abrasive and removes the decay build-up from your teeth. It also remineralizes the enamel as well as the dentine of the damaged tooth (22). After you have brushed your teeth, swish the hydrogen peroxide in your mouth for 5-7 seconds. Spit it out and rinse your mouth with plain water a few times. This is best done once a day, before going to bed. 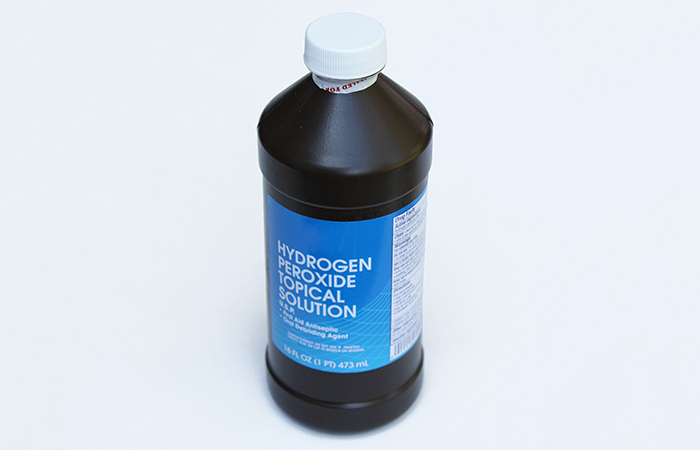 The antimicrobial activity of hydrogen peroxide will kill the bacteria present in your mouth and treat the cavity. Using this mouth rinse will also prevent tooth decay, gingivitis, and plaque in the future (23). Do not keep the hydrogen peroxide in your mouth for longer than the time mentioned as it can irritate the skin inside your mouth. Also, use this mouth rinse for a couple of days and then give a gap of a few months before repeating its usage. Gargle with aloe vera juice and swish it around your mouth a few minutes after brushing your teeth. Rinse your mouth with clean water to remove the taste of the aloe juice. Alternatively, you can use aloe vera gel as a toothpaste. You can do this twice a day. The anthraquinones present in aloe vera control the tooth decay-causing bacteria. Aloe vera also exerts an anti-inflammatory effect on the affected tooth and gum, reducing the swelling and pain. It also promotes fast recovery with its wound healing components (24). Chew on one end of the licorice root until the fibers of the root come out. Do this for approximately 1-2 minutes. Gently rub these fibers on your teeth and gums. Rinse your mouth with clean water. You can cut the used part of the root and reuse the same stick the next day. Licorice root can be used every day as a toothbrush. 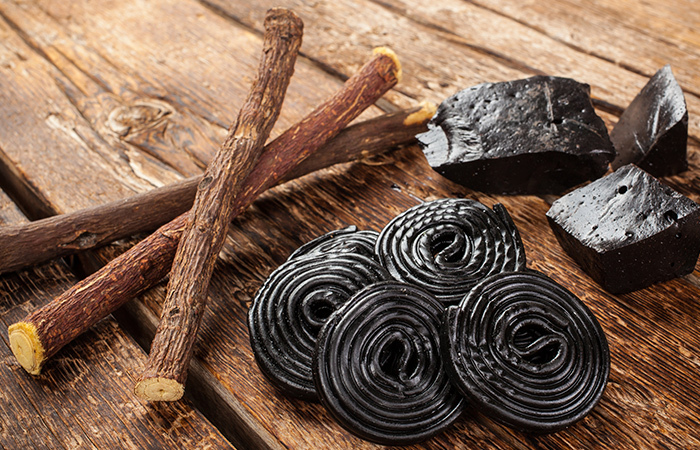 Licorice root’s components exhibit antibacterial properties against the oral bacteria. They treat infections and also prevent their occurrence in the future (25). Add eucalyptus oil to your regular toothpaste and brush your teeth as usual with the same. Repeat this every day until the cavity heals. Eucalyptus oil inhibits the growth of the oral bacteria responsible for causing tooth decay and cavities (26). If your problems with cavities persist even after trying these measures, you should consult your dentist. While elders can observe the changes happening with their teeth, children and young kids may not be able to understand or notice it. So, as parents, you need to keep checking their teeth often and ensure regular visits to the dentist. You also need to make certain changes in your diet by eliminating foods that increase the chances of tooth decay and cavities. A list of the food items best avoided is given below. As it has been rightly said, prevention is better than cure. Here are a few must-do things to keep your mouth, teeth, and gums healthy. They help prevent the cavities that occur as a result of tooth decay. Make sure you brush your teeth twice a day. Do it properly with the time and attention it deserves for the beautiful smile on your face. Do not forget to gargle with normal water after each meal to get rid of any titbits of food left in your mouth that can give way to bacteria. Bacteria become highly active at night as you go to sleep after your meals. It becomes important and crucial to ensure that your mouth is free of any trouble-causing agents. 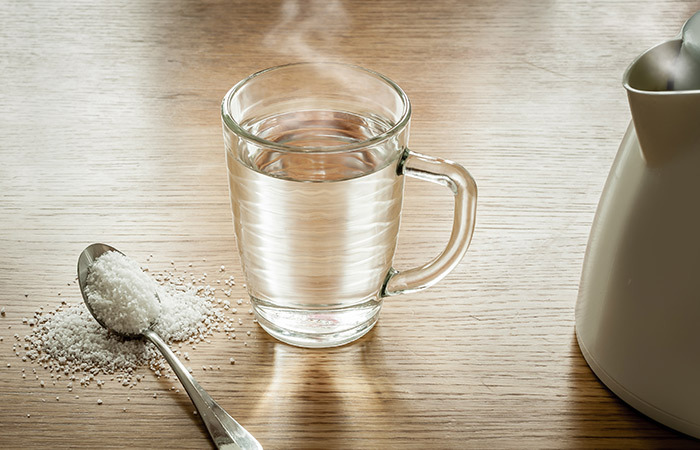 So, try this age-old remedial measure every night – gargle your mouth with lukewarm water mixed with salt. Chewing your food properly can also help keep tooth decay at bay as it helps produce enzymes that kill the decay-causing bacteria. To keep your teeth healthy, massage your teeth with clove oil as often as possible. Alternately, if it is not possible to massage with clove oil, chew one after your meals to keep your mouth and teeth clean and pain-free. If you are averse to having onions in your salad, you just might want to reconsider. Onions are good for your mouth and oral health as they kill the bacteria and germs in the mouth effectively. Ensure you floss often to get rid of food particles and components that could possibly be hiding in your mouth and the gaps between the teeth. If not possible, make sure you floss before you hit the bed at night. Chewing gum is also an amazing way to keep your teeth healthy. While it makes the teeth and gums stronger, its sticky nature also helps to remove those stubborn food particles out of their hiding place. It also leads to the production of saliva in the mouth, which further works to keep the mouth clean and healthy. 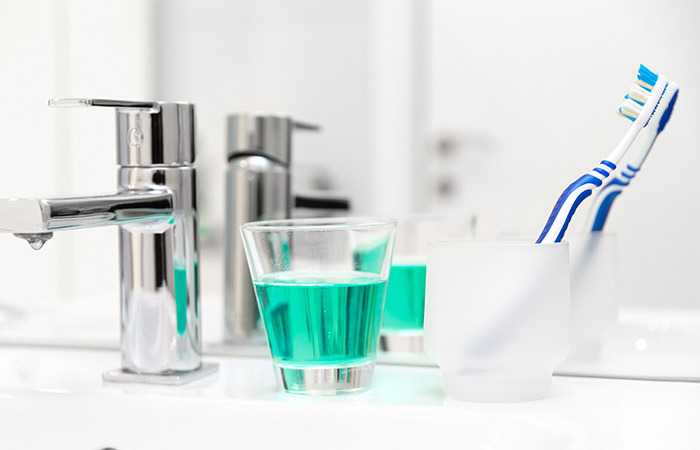 A mouthwash is an amazing way to clean your mouth and teeth. Use a good mouthwash with fluoride to get effective protection from bacteria and plaque. Foods rich in fiber, like all those vegetables that are served in salads, are a good way to reduce plaque that leads to tooth decay over time. Include foods like cabbage, broccoli, cucumber, cauliflower, tomatoes, lettuce, radish, etc. in your daily meals. Visit the dentist regularly to ensure your mouth is healthy and oral hygiene is not compromised. If the damage is only at the top, the dentist might go ahead and use capping to treat it. This would mean food restrictions for a few days to let the tooth recover. Then, it is filled with a silver-based component. However, this needs care and proper oral hygiene as well. If the tooth decay has caused more damage to the tooth or teeth and destroyed them beyond repair, the doctor might extract the tooth to prevent the decay from spreading. Tooth extraction is rather a painful process, so I hope no one ever has to go through it. If the tooth can be saved by the doctor, he/she might propose root canal treatment (RCT) to get rid of the decayed tooth. Many of us try to be experts, but please remember that your teeth are irreplaceable. Once they are damaged, not much can be done about it except a regular visit to the dentist to get dentures! 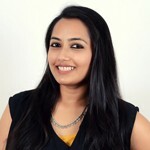 So, keep that smile alive with these simple home remedies. Remember, your smile can light up a room! Now that you know how to get rid of cavities, it’s time you give these remedies a try. Hope you found this article helpful. Do share your feedback with us in the comments section. Is There A Link Between Oral Health & Heart Diseases? Do You Know Chocolates Can Prevent Tooth Decay? Find Out How!